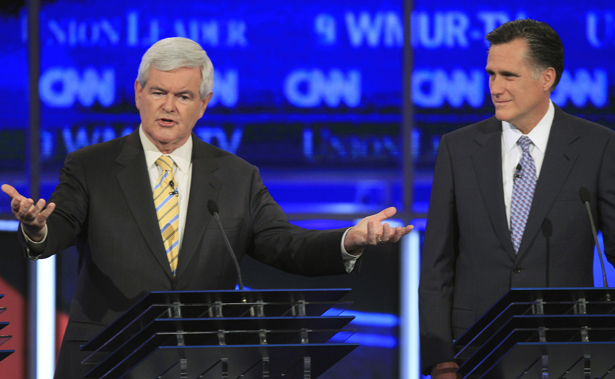 Has the GOP Establishment Defeated Gingrich? Republican insiders have been eager to do Mitt Romney’s dirty work. It has worked in Florida—but there’s a still a long race ahead. Republican presidential candidate, former House Speaker Newt Gingrich and former Massachusetts Gov. Mitt Romney participate in a presidential debate at St. Anselm College in Manchester, NH, June 13, 2011 (AP Photo/Jim Cole, File). On the night of Newt Gingrich’s victory in the South Carolina primary, Republican strategist Steve Schmidt predicted on MSNBC that the GOP establishment would “panic” if Gingrich won Florida. They didn’t wait that long. As soon as Gingrich’s bounce from South Carolina briefly brought him to the top of the polls in Florida, the Romney campaign and the Republican establishment amplified their attacks on Gingrich. The Romney campaign holds daily press calls criticizing Gingrich. In addition to the lower-profile surrogates such as Senator Jim Talent (R-MO) and former Representative Susan Molinari (R-NY), they’ve started dispatching some heavy hitters. Last week Senator John McCain held a call complaining that Gingrich was a profligate pork-barrel spender. National Review’s most significant blow to Gingrich last week surely came in the form of an article by Elliot Abrams. Abrams is the epitome of a neoconservative Republican insider: son-in-law to Commentary’s Norman Podhoretz and Midge Decter, Abrams served in President Reagan’s State Department and on George W. Bush’s National Security Council. Abrams recalls with tremendous bitterness that during the 1980s, Gingrich was frequently critical of Reagan’s foreign policy. And in typical Gingrich fashion, he used wildly over-heated rhetoric to make his argument. Abrams depicts Gingrich as a hostile critic of Reagan’s policies that supposedly slayed the Soviet Union. This cuts directly into the central argument of Gingrich’s candidacy, that he is the “Reagan conservative” who worked with Reagan and will replicate Reagan’s successes. As Politico reported, these attacks reverberated widely in the conservative echo chamber. The Drudge Report linked prominently to anti-Gingrich items such as the Abrams piece. The biggest boost to Gingrich may have come Friday evening when Herman Cain endorsed him. Even though the accusations of long-term adultery and serial sexual harassment—along with Cain’s embarrassing feeble grasp of important policy issues—derailed Cain’s candidacy, he remains a popular figure on the right. Many times on the campaign trail I interviewed former Cain supporters who said they were having trouble choosing a new candidate and they would vote for Cain if he got back in the race. Even so, the onslaught of establishment criticisms and negative ads from Romney’s campaign and his Super PAC seemed to have succeeded in reversing Gingrich’s momentum. Recent polls show Romney headed for a double-digit victory in Florida. Unlike revelations of his past infidelity in mainstream news outlets, Gingrich cannot turn these criticisms to his advantage by attacking the media. The result, as we saw in Thursday’s debate in Jacksonville, was Gingrich’s being hoisted by his own petard on everything from his relationship with Freddie Mac to his attacks on Romney’s wealth to his past support for an individual mandate in health insurance. The question going forward will be whether Romney and his establishment backers have Gingrich down or out. Gingrich has come back from the dead twice before in just the last two months. Maybe he can again.